Recliner Armchair. ▲ extendible footrest - Pull the Footrest to Raise it up. Recliner Armchair 1. Chair Components. ▲ Reclining back - Pull the Back to Recline the Chair. Colour: Beige. Pet Supplies. Recliner Armchair. ▲ extendible footrest - Pull the Footrest to Raise it up. Recliner Armchair 1. ▲ Reclining back - Pull the Back to Recline the Chair. Chair Components. Colour: Brown Check. Seat Size(D W): 50 49 cm. It is in sound used condition and stands 85cm high by 53cm wide at the back, the arms are 52cm high by 62cm wide and the seat is 42cm high by 50cm wide by 50cm deep. The chair is the perfect piece of furniture for your living room, dining room, bedroom or special occasions. This item is available in chenille fabric and poly-blend canvas fabric cover to maximum the seating experience. Chrome and Red Fabric Swivel Chair Mid Century Vintage Retro 1970s Scandi. Condition is Used, but generally good. Would be great if reupholstered. Seat width 61cm. Doesn’t lounge back. Collection only SE4, Brockley. Every single sofa chair is individually hand-crafted by using traditional techniques for the ultimate quality;. Part assembly required approx 5 min per chair. Legs finish :As pictures show. Seat height: 45 cm. Beautiful vintage chair. Completely stripped back to original wood and springs. Bentwood arms and legs sanded back/restained in oak colour. New foam was used and covered in a green/beige fashionable patchwork unique design. This an extremely comfortable chair to sit in due to the sprung base and back with sprung lumbar support. Every chair i restore is unique as i dont make the same design twice. REDUCED FOR QUICK SALE. I NEED THE SPACE. THE FOAM COST MORE THAN THIS. NO FURTHER REDUCTIONS. Iconic20thcentury bring you these Stunning Space Age Lounge Chairs. There are 3 available. Mid Century furniture only increases in value and is the future antique. Both stylish and durable, you are investing your money in practical and yet stylish designs. The fabric is very clean along with matching cushion, about 3 or 4 studs missing. Kitchen & Dining. Could be used as dining room, living room, bedroom furnitures. High quality Linen fabric using, advance sense in appearance. Rubber leg pad make your floor be avoided scratched. Color: Gray. This auction is for a Vintage Fireside Chair, re-upholstered and in good sound condition. Please be aware that this is a Vintage and therefore used item so it is not in mint condition. Please look closely at all photo’s and ask any questions before bidding. Beautiful vintage chair. Completely stripped back to original wood and springs. Bentwood arms and legs sanded back/restained in ebony. New foam was used and covered in a black/purple fashionable patchwork unique design. Purple leatherlook patches on seat and back with 4 diamonte buttons to finish. The head cushion flips over the back when not in use. This an extremely comfortable chair to sit in due to the sprung base and back with sprung lumbar support. Every chair i restore is unique as i dont make the same design twice. REDUCED FOR QUICK SALE. I NEED THE ROOM. NEW FOAM COST MORE THAN THIS. BARGAIN. NO FURTHER REDUCTIONS. Bedroom Living Rooms Accent Chair Armchair Single Seat Sofa Wood Legs Furniture. A stylish wingback chair with deep padding and armrests for comfort along with stitched details and stylish studs detail. 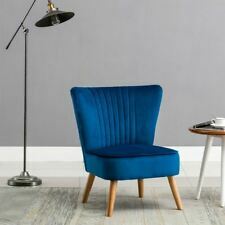 Whether it’s for your living room study or bedroom this chair will fit beautifully. Finish: Light Grey. Padded Seat. A stylish wingback chair with deep padding and armrests for comfort along with stitched details and stylish studs detail. Bedroom Living Rooms Accent Chair Armchair Single Seat Sofa Wood Legs Furniture. Retro Fabric Accent Occasional Lounge Chair w/ Kidney Pillow Upholstered. Kitchen & Dining. Material: Linen Fabric Black Pine Wood Leg. The sturdy legs is coated with black finish. Ready to Assemble. Type: Recliner Armchair. 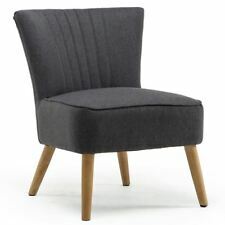 1pcs Armchair. Soft cloth and elastic sponge makes it so comfy to sit on. Fit for: Living Room, Bed Room, Reading Room etc. Cell Phone Parts. Materials: Fabric. Motor Parts. Round corner design is good to anti-collision. 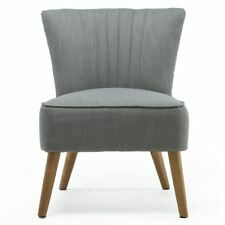 Linen Fabric Occasional Bedroom Living Room Accent Chair Armchair Lounge Retro Style. Great in the Lounge or Bedroom. 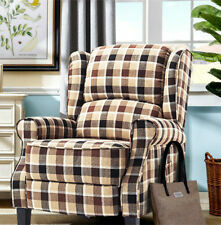 1xOccasional Bedroom Living Room Accent Chair. Elegant Style - A beautiful accent chair with winged sides, a high back, stitching details, studs to the arms and dark wooden legs.